Is Mike Trout the AL MVP? Jobu examines Mike Trout’s MVP chances. Last time, we posed this question about Derek Jeter. I didn’t want to make myself seem like a total homer, and I wanted show respect to the other guys that deserve serious consideration for the award. For that reason, I will be previewing a couple of the other MVP candidates. Today, we have Mike Trout, who is trying to become one of few rookies to ever win the MVP award. 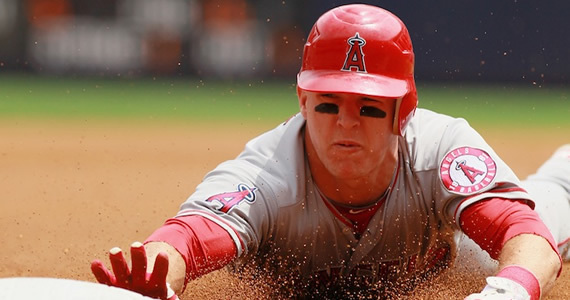 There are few players in their primes who put up numbers like Trout has put up in 2012. It usually takes guys a few years to hone their skills and learn the league well enough to be in the MVP consideration. 20 year old Mike Trout of the Los Angeles Angels is already there. While Trout did play in 40 games for the Angels last season, he still qualifies as a rookie because he didn’t get enough plate appearances while with the big league club. If offense was all this kid was doing right, I might not be as adamant about his MVP chances. The fact of the matter is that Trout will most likely take home a Gold Glove this season. There’s no reason why he shouldn’t. He’s been making incredible catches all season long. I think he might be the most overall talented player in all of baseball right now. As I said before, for a 20 year old to be putting up such gaudy numbers isn’t very common at all. Not only that, but he helped turn the Angels completely around. After that dismal April, Trout led the Angels to an 49-32 record over their next 81 games (.604), and jumped them right back into the playoff picture. While they have tapered off of late, you can hardly blame that on Trout. The blame can be placed on the shoulders of their overpaid pitching staff (looking at you C.J. Wilson) and a struggling bullpen (Ernesto Frieri…talking about you, buddy!). There are three things that might hurt Trout’s chances. First of all, the competition for the American League MVP award is very stiff. He’s dealing with the likes of Derek Jeter and Cabrera (whom we’ll profile next time). Second, as I previously stated, the Angels have been crawling toward the finish line. If they miss the playoffs, that should hurt Trout’s chances significantly. Finally, being a rookie might actually hurt his chances as well. If writers think he’s probably going to contend for the MVP for the next ten or fifteen years, they might give it to someone who has been kind of waiting longer (say Jeter or Cabrera), or someone whose team actually makes the playoffs. It will be interesting to see how the Angels, and the teams of the other MVP candidates, do down the stretch. If Jeter’s Yankees hold off the Orioles to win the division, and the Angels can’t overcome the Texas Rangers or Oakland Athletics, the tides might turn against the 20 year old from Vineland, NJ. At least he’ll be winning the Rookie of the Year.